Mice come into the home because the house is warm, it provides them protection, and it gives them plenty of food. Once inside your home, mice will use the darkest corridors to get around, including crawl spaces, attics, air ducts, and walls. They run around unseen in their attempts to locate food. 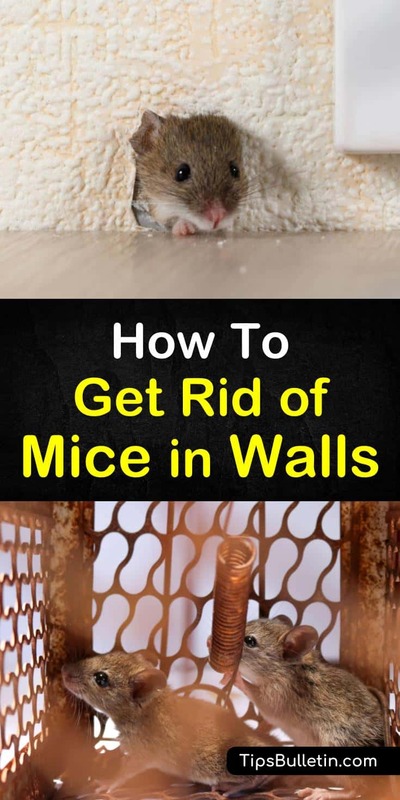 What you need to do is figure out how to get rid of mice in walls. Mice can quickly gain access to your home, as they can squeeze their bodies through a dime-sized hole. If they make it into your home and go undetected, they can cause all kinds of problems. Mice living inside your home often go unnoticed because they stay in their nests during the day. Keeping mice away once they establish themselves in your home is not an easy task, but total mouse control is possible. Do Mice Live In My Home? To keep mice away, you must first figure out if you have mice or something else living in your walls to ensure you are using the right pest control method. To do this, you must look for evidence of mice inside your home. Most people learn they have mice due to the mice scratching, gnawing, and clawing inside the walls. Mice will chew wooden surfaces, as well as cardboard to gather needed materials for their nests. Other signs that you might have mice inside the walls of your home include chewed through plastic bags of food. Or perhaps you saw one running across the floor or along the countertops. Mice runs can indicate the presence of mice in your home, as well as oily stains along corners of baseboards. Mice travel the same routes every day, so they leave runs behind along floors, tables, and drywall. Mouse droppings are another sign of a mouse problem in your home. Droppings will look different based on whether they are new or old. Both look like tiny seeds, but fresh droppings will be black and shiny, while old ones look dried out and faded in color. The final clue to a mice infestation is their nests. Some nests you will see, such as under old clothes in the basement. Others you will not see, as they are built inside the walls or crawl spaces of your home. How you know if mice are building nests within your home includes finding chewed up cardboard boxes or clothing. Strange smells that come from darker areas of your home can also indicate a mouse nest. If you do find signs of mice, all you can do is learn how to get rid of mice in your house as quickly as possible. Understanding how to get rid of mice in attic is not as easy as one might think, as the attic presents some unique problems for homeowners. One problem is how many hiding places there are for mice in the attic. The more cluttered the attic is with storage boxes, the more places mice have to hide. How to get rid of mice in attic with blown insulation is a little different than a regular attic because of the insulation. Clean the attic first and remove any mice droppings and nests that you can find. All holes around the edge of the attic need sealing with mesh wire screwed with screws to prevent mice from coming back. Place mouse traps all around the attic close to the blown insulation. Bait traps with cheese or peanut butter, but do not set the traps. Let the mice think they have found new food sources. After about 48 hours rebait the traps and set them. Check traps every few days remove any trapped mice and rebait the traps. Mint plants act as a mouse repellent, as mice do not like the odor put out by the plants. Place the plants throughout the attic and replace as needed. Bait stations can be used in place of traps in warmer climates with a well-ventilated attic, as the mouse corpse will dry out without creating odor problems. Mice in the ceiling present a considerable challenge, as they will chew insulation, gnaw on electrical wires, and create a fire hazard. How to get rid of mice in ceilings first involves mouse proofing followed by exterminating. Check the lower level of your house first, including basement window frames and foundation vents. Use exterior grade caulking to fill gaps ½ inch or less. Pack larger holes with stainless steel wool, and then cover with caulk. Set two snap traps side by side along ceiling joists. A set of traps should be placed at each end of the beam. Bait the traps with something to attract mice, such as peanut butter. Traps should also be situated inside drop ceilings and any potential exit point. Check traps every day using gloves and dispose of dead mice. If you think you have just one mouse, think again because there is never only one mouse. 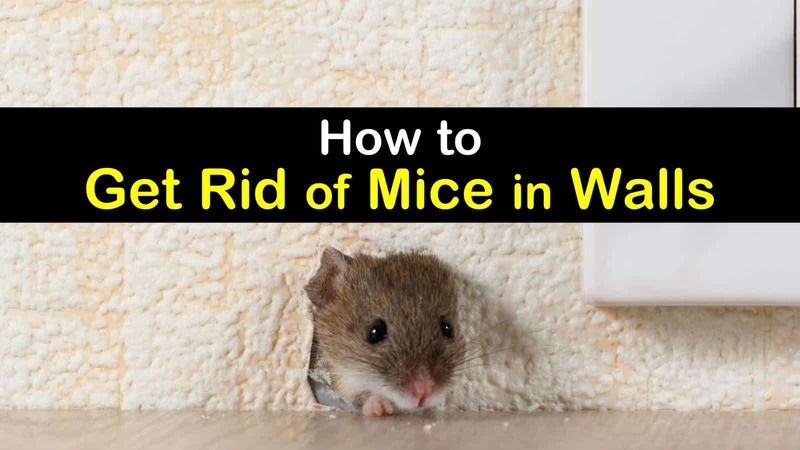 Once mice get in your walls, there are few things you can do to get them out. Drill a small hole in the wall a few inches above your floor. Drill the same size hold in a cardboard box. Place a food-scented trap inside the box and cover box with cellophane. Secure the box against the wall, so the two holes are lined up. Replace bait traps inside the cardboard box as needed until all mice are gone. Once the mouse infestation is gone for good, patch the drywall. Baiting mice with poison presents a problem. The mice eat the poison bait and then go back to their nest where they may die. If their nest is inside your walls, you have dead mice in the walls. Get rid of mice without poison. The best remedy to get rid of mice without poison is traps. Homeowners can use spring-loaded traps, live traps, and glue traps. Some traps are designed to kill the mice; others require homeowners to release the mice back outside. The critical thing to remember about traps is you must correctly place traps for them to be effective. Traps that are not correctly set are not only ineffective; they also pose a danger to kids and pets inside the home. Cotton balls soaked in vinegar or peppermint oil will not kill mice, but it will deter them. Saturate as many cotton balls as you need in vinegar. Place them in areas frequented by mice. Replace the cotton balls when you can no longer smell the vinegar. Discontinue using them once there are no longer any signs of mice. Sometimes discovering a mouse problem comes down to your sense of smell. You may not ever see the mice or evidence of mice in your home, but the stench of a dead mouse is unmistakable. How to get rid of dead mouse smell involves getting rid of the corpse. To remove the dead mouse, you will need first to locate it, which can be done with a borescope or a small camera. Once found, cut the drywall, remove the mouse, and then patch the drywall. Once you have gotten rid of the infestation, you need to prevent it from happening again. Mice can enter through some pretty tiny holes. The first thing to do is inspect the foundation of your house. Any holes dime-sized or bigger need to be sealed as these are common entry points for mice. Steel wool can be used to seal the holes as mice will not chew through it. Look for any gaps around your ducts, roofs, utility pipes, dryer vents, etc., and seal any point of entry. Once you finish examining the outside of your home, it is time to take care of the inside. Mice come in your house through small holes in search of food. How to keep mice out involves eliminating their food source. Store food in airtight containers, such as glass or stainless steel. Keep countertops, sinks, and floors clean of all crumbs. Thanks for reading this post on how to get rid of mice in walls, ceilings, and attic. We hope these tips on how to keep mice out of your house were useful. If you found any of mice control tricks helpful, please share with others through Facebook and Pinterest.